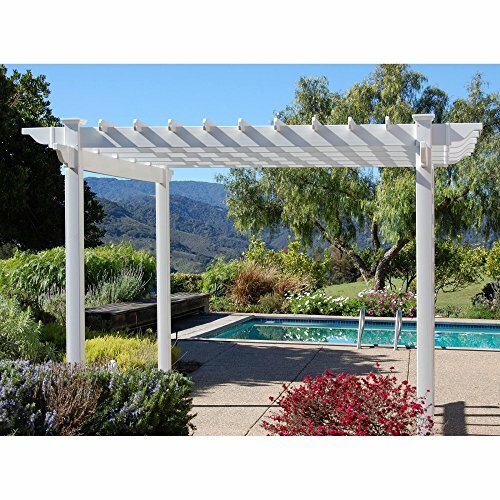 The Asian-inspired Dura-Trel Queensbrook Pergola offers your backyard, patio, or pool area shade and style. This pergola is made of maintenance-free vinyl in a crisp white finish. Pre-drilled holes ensure easy assembly and steel ground anchors mean this pergola will stay put. It includes a 20-year limited manufacturer's warranty. Durability, versatility, reliability, and quality. These are the cornerstones of Dura-Trel's commitment to you. Our lawn and garden selections are an unbeatable and maintenance-free enhancement that can help transform the outdoors from average to outstanding. As you would expect from a national corporation with over 25 years of experience like ours, we offer competitive pricing and quick delivery. But we also have something our competitors don't - a custom production process that blends the efficiency of large-scale manufacturing with the time-honored qualities of hand-crafting traditions. Additional limited-time savings reflected in current price. Dimensions: 115L x 115W x 96H in.. White finish. 100% maintenance-free vinyl. Pre-drilled holes for easy assembly. Includes steel ground anchors. Asian-inspired top design. 20-year limited manufacturer's warranty. Dimensions: 115L x 115W x 96H in. If you have any questions about this product by Dura-Trel, contact us by completing and submitting the form below. If you are looking for a specif part number, please include it with your message.